Lt Donald Miller was one of the pilots who began his service with the 492nd under Col Pierce. Miller was given command of the Hershey Crew that had transferred in from the 32nd CCTS (Combat Crew Training School) in Tucson, Arizona. See the Training link. There was one more personnel change made. The crew was assigned to the 858th BS, designated as Crew 810. Since Miller was one of the more experienced pilots, his crew was appointed to serve as a Lead Crew. Miller signed out for a B-24J, 44-40167. The crew nicknamed it SIERRA BLANCA. Sgt Dezarlo painted the nose art in the US before leaving to England. 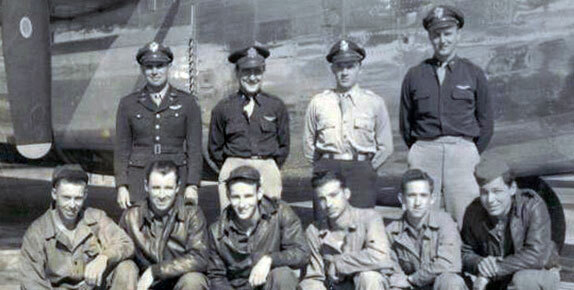 In April '44, they flew their assigned ship to North Pickenham, England, via the southern route. Cpl Bennett, one of the staff clerks, flew with them, bumping Sgt Frabizio onto the Queen Elizabeth. By our count, Miller flew as the aircraft commander for Crew 810 for a total of 13 missions. We don't have a loading list (personnel roster) for each mission flown. Since they were a Lead Crew it was typical for them to have an extra man, like a staff commander or a pilotage navigator/bombardier, flying with them. The Crew suffered its first casualty on 15 May 44 while on a bombing raid designed to knockout a V-1 rocket base near Siracourt. As the Group flew through the flak-filled skies over Ostend, one shell penetrated clean through ship before denotating above them. It had passed right through the co-pilot's chair, killing Lt Sonner in the process. It was the Group's first casualty by enemy action. On 29 May, Don Miller was promoted to 1st Lt.
On 18 Jun 44, Crew 810 encountered another heavy dose of flak. This time the target was an airfield near Luneburg. The flak damage they suffered that day was too extensive for the ship to fly back to England, prompting Miller to head for Sweden instead. Eleven men were interned there, as they were carrying an extra bombardier to serve as a pilotage navigator. MACR 6767. The 11th man, Lt Barrett, came into the Group with the Beumeler/Wilson replacement crew. Beumeler was replaced by Testa who had been serving in the command staff. For more information on the Beumeler/Wilson Crew, see Testa Crew R-13.